Wanigan. – Dirty wet dog , boats and sailing. Everybody except the canoeists now scratch their heads. No, i haven’t got to the point of running out of normal words but i have built a Wanigan for Inanda. What’s a Wanigan then i can hear y’all saying ?……well kiddies allow this old canoeist to explain. Basically it’s a box although properly it’s a storage box that is designed and built to sit inside an open canoe and usually gets used to carry the canoeist’s kitchen and some of their ‘ready’ food. The term comes directly from one of the Canadian native languages btw. Some canoe Wanigan’s are actually built with curved bottoms to fit the curve of the hull and some of them are set up with tump-straps so that they can be carried from the forehead. My version is a slightly smarter version of the stacking food crates that i have used for many years at home, and before that, and then more recently for my food stowage aboard WABI”’. Aboard WABI”’ i found that once i had taken the sea-toilet out that 2 plastic stacking crates ( 42 litre) would make an excellent dry larder in one and the other could be modified as a coolbox. Aboard Inanda i found that a 42 litre stacking crate sat exactly between the 2 bunks and at almost the perfect height to serve as my coffee table and food preparation area next to my sitting position. That size of crate would just go through the companionway hatch on WABI”’ and it’s the same with Inanda. I was happy with the plastic crates on WABI”’ as their utilitarian nature seemed to match the boat but Inanda is very ‘woody’ and i think deserves something a bit nicer. I need a working surface to prepare food on aboard Inanda and i often do that when i am sat on one of the bunks, also when we are on board we often sit longways in the bunks ‘feet-up’ and a raised box to put things on seemed like a good idea. Obviously it restricts movement forward but to be honest we don’t need to get into the forepeak very much and when we do i can just slide the box aft. Because i can’t just drive over to the boat in 10 minutes (more like 10 hours) i want to get on with some projects like this at home. I did bring the old galley structure home and knock that apart because i might be able to use some pieces of the mahogany again to finish the new version. Anyway, lets do some quick and dirty boatbuilding. The first stage of this one was to find whatever pieces of scrap plywood might be big enough to make the basic box with. Having recently built a bathroom with mainly 12mm plywood for the walls there was enough of that laying around to make the sides and a piece of 18mm to make the base out of. Building the box is just straightforward ‘glue and screw’ construction with some West epoxy, microfibres and filler. Because i would be bonding end grain ply to face grain i pre-wet the end grain and temporarily put screws through on each edge. I didn’t leave the screws in, no need really, but filled the holes when i did the second stage construction which is to epoxy fillet each inside join with a glue and filler epoxy fillet. As i write i have just spent a couple of hours smoothing the fillets and rounding off all the external corners . While i am having a coffee break i have the heater on completely warming and drying the inside before i epoxy coat the whole of the inside. The final dimensions are slightly larger than the crate as i have gone longer and taller…my plan, half way through the project is to build half of the inside as an ice-box with insulation and a thin ply/epoxy liner. Something i can’t quite work out is what to finish the inside with, i do remember a food safe epoxy coating but haven’t seen that for years. Bare wood might be the healthiest but only until it gets food-grunge embedded in it ! Day 2…..and i actually had to go out and buy some materials. Having built the box out of plywood that i just have as scrap in the workshop and the remnants of some epoxy resin i had to go out and get some insulation board and 4mm ply to make the insulation and the inner box. The 25mm celotex foam board isn’t really thick enough but i don’t really have the space to use a 50mm layer all round. When i did this job last time on the Frances 26 i had to build an icebox in situ into an awkward shape and i step-laminated 2 layers of similar board except where i could use a single 50mm layer. What i did then on that job was to make a GRP/foam box as the liner using some constructional foam board. I haven’t got any of that left and i know that the local GRP/epoxy supplier doesn’t stock it any more. Anyway, day 2, the inside of the box is coated after smoothing-off the fillets and i have close-fitted the insulation board and the box divider. I might put an extra piece of 25mm board in the bottom to reduce the heat leak through the base. If i can find some epoxy compatible foam board in town i might build the inner box out of foam/epoxy and glass cloth which would then be extra insulation and completely waterproof. PS…i didn’t so it’s thin plywood and lots of poxy. Mid afternoon in the epoxy oven….also known as the greenhouse. The icebox liner is filleted in and it’s all just baking off nicely. Next job is to coat the liner and set the icebox lid in. If all goes well i might even get some 2-pack primer on today. Making the top. 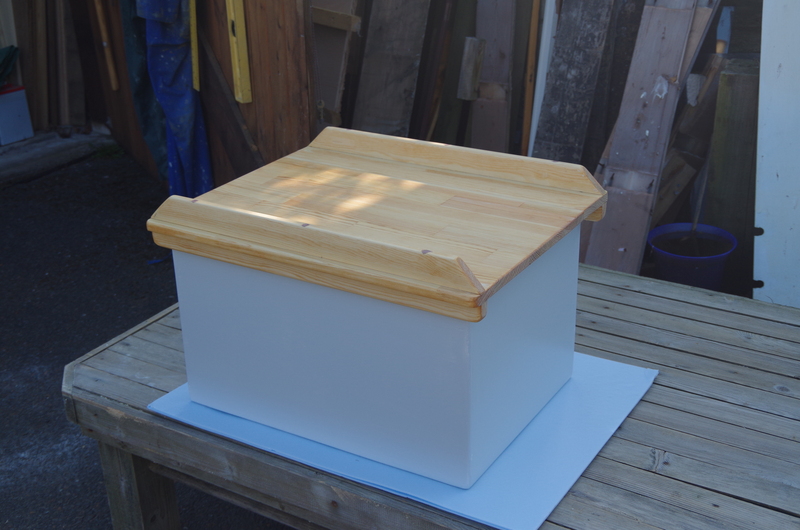 I had hoped to make a decent lid out of scrap wood i had laying around….like the remnants of the old bathroom floor. Unfortunately i really need the top to be flat and plane so that i can use it as a chart table and general boat table-top. My small craft chart folio’s are about the same size as the box itself and it will be sheer luxury to have a chart table aboard Inanda. Instead of scrap i actually had to drive over to the DIY store and buy a couple of boards and then edge-glue them together on my improvised glueing bench…..epoxy went off nicely in the sun today. Meanwhile the box is in the workshop getting some paint on. One side is the dry-bin which will act as the general larder, the other side is the ice-box. As nearly always with my own projects i can see the mistakes rather than the finished product which looks functional enough. The top will act as our food preparation area and chart table. I can see a way (several ways) of making it a lot better but i very rarely get things like this exactly right first time because i don’t spend anything like enough time doing this kind of thing. It’s a good ‘tools and skills’ warm-up for the harder jobs to come though. Now the workshop needs a good clean-out of the waste material and dozens of crusty glue cups and discarded gloves….in fact it’s such a nice day that i’m going to empty one side of the workshop right out , clean it and re-organise it. Finally….aboard Inanda, iced, stocked and charts in play. Version 2 could be a little bit wider and slightly taller as the lid runners interfere with the bunk edges. Works well though ! On the trip i spent several hours at my improvised chart table doing the navigation and tides for the Thames and beyond. When i cook i find i want to sit to port which is next to the cooker and do the food prep on a big cutting board on top of the box and temporarily stow the charts….i can see a use for one of those ‘posh’ cockpit chart bags to keep my chart folio’s in . Previous E is for everything else.